I don’t have a lab and am looking for ways to have technology things without computers; I have wireless so I like the BYOL (bring your own laptop) idea. Maybe instead of “fault” look at it as “serendipity.” You didn’t announce registration, and you got an overflow crowd. I wonder how you can harness that. Your poster for the class made me want to be there! Ride the wave. Put on shades–you are that cool. Seconding that the poster is great! And class too, I’m sure! Wow, I can’t get over how nice that poster is! 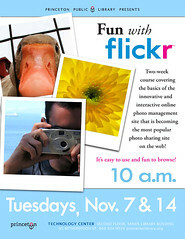 I’m hoping to teach a Flickr class at my library soon. We’re already planning a “Blogging for beginners” class, so hopefully we’ll be adding more web 2.0 type topics. Thanks for this blog, btw.